Polish carbine wzog 29, type Mauser and WZ38 Maroszek rifle. No serial number!. Excellent fullered heavy bright finished blade with Polish makers name F. B. RADOM in two lines on the ricasso. It has the typical factory sharpening for this model. It is sharpened for about 1/2 blade.The reverse side shows a Polish eagle over date 1939. Blade spine is crisp marked with a German Waffenambt marking over 77. Large bright finished pommel with T-O mortise slot and thin crossguard. Sun Burst inspection mark near the slot and another inspection mark on the reverse of the blade tang. Muzzle ring removed. No flash guard. Excellent wooden grips, screwed to the blade tang and not riveted. Oil cleaning hole in grips. 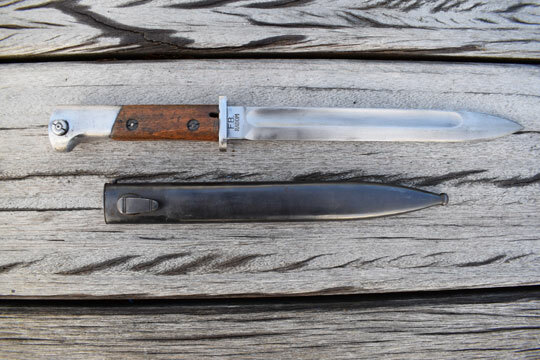 Excellent dark blued German scabbard with no markings, no serial numbers and no dents. Very rare bayonet in an EXCELLENT condition, made and used under German occupation but no serial numbered and not blued!